Way back on Jan. 22, Bethlehem Steel FC signed a promising young Cameroonian defender named Olivier Mbaizo. “Olivier is an exciting addition for us,” said Steel head coach Brendan Burke during the announcement. It was a simpler time— a time filled with hope. But just like most seasons of soccer in Philadelphia, it didn’t take long for Mbaizo’s promise to sour. Back on Apr. 11, uncertainty clouded Mbaizo’s future in Philadelphia. 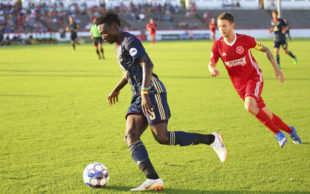 It had been roughly eight weeks since the Cameroonian defender was sent home from the Union’s preseason tuneups in Florida after picking up an injury. Until that day in April, there was nothing. No updates on the injury. No sideline sightings at practice. It was as if the 20-year-old had vanished. But Union head coach Jim Curtin broke that silence, announcing Mbaizo was back and training fully… with the first team. And six days later, before ever playing a game for the Steel, the Union announced Mbaizo had been signed to a first team contract. “[Mbaizo] has earned this quick ascension to our first team through his play in preseason, and we look forward to further integrating him and assisting with his development,” said former Union Sporting Director Earnie Stewart after the signing. And that first step in the full back’s development came in his professional debut on Apr. 28 with the Steel. While Mbaizo has yet to make his first MLS appearance, he has made an additional 12 starts with the Union’s USL affiliate. His lastest outing, on the road against Richmond Kickers Saturday evening, was the best of the bunch. Mbaizo was at the forefront of Bethlehem’s impressive 3-0 victory. He was a dynamic presence roaring up the right flank. It helped that the Kickers’ wingers, playing in a familiar 4-2-3-1, presented little defensive help. Mbaizo was rewarded for his forward thinking with his first professional assist. Protecting a one-goal lead in the 78th minute, the French-speaking defender capitalized on acres of space, continuing a threatening run to within yards of the opposing corner flag. With time, Mbaizo lofted a pinpoint cross to the head of midfielder Omar Holness, who had no trouble doubling the Steel’s lead. Mbaizo’s night wasn’t done with one primary assist. He helped ice the game just seven minutes later. A lethal counterattacking goal started on the right wing with attacker Michee Ngalina, who laid the ball off to his right back. After taking a touch, Mbaizo quickly played a through-ball back to his continental compatriot who found himself alone on goal. After rounding the keeper, Ngalina buried Bethlehem’s third and final goal of the game. It was a breakout game that was a long time coming for the talented Union prospect, who will turn 21 in nine short days.